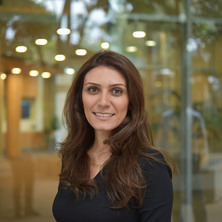 Dr Nasim Amiralian is a UQ Amplify Fellow in the area of nanomaterials engineering. During her PhD, she discovered and patented a unique high-quality cellulose nanofibre from spinifex, an Australian native arid grass, using simpler and more environmentally friendly methods. The outcome of her PhD project has resulted in substantial new research thrust at UQ, three patent applications, several commercial opportunities, and most importantly establishment of Australia’s first nanocellulose pilot production plant. Building on her innovations in spinifex nanocellulose, she is combining her expertise in materials engineering, nanotechnology and textile engineering and utilising the unique properties of nanocellulose to produce novel conductive hydrogel systems which could lead to improved conductive hydrogel technology. In recognition of her contribution to the field of nanomaterials engineering and research excellence she has received a number of awards including; one of Australia’s Top 5 Scientists (ABC/UNSW, 2018), Queensland Women in STEM Prize- judges choice award (2017), Women in Technology Life Sciences and/or Infotech Rising Star Award (2016), AIBN Research Excellence Award (2016), a Class of 2014 Future Leader award and Best poster prize at the Australian Nanotechnology Network ECR Entrepreneurship workshop(2015). Dr Amiralian has been instrumental in the development of a culture of collaboration and career support for the next generation of research leaders, in particular women in science. She has been engaged in communities such as Early Career Researcher committee, Women in Technology (WiT) Life science committee, and conferences committee and also play role as a Queensland Flying Scientist. Dr Amiralian also has been an invited committee member of Standards Australia and Joint Standards Australia/Standards New Zealand, contributing to the preliminary work item for ISO/TC229 JWG2 on the characterisation of nanoparticles, and serving as the treasurer of the RACI Queensland polymer division. Her research has afforded unique opportunities to drive collaborations with Indigenous Australians and industry partners. She has forged collaborations with both groups of partners, and built trust in these relationships through positive outcomes and considerate navigation of complex landscapes that bridge the academic-industrial divide. Over time, these collaborations have given her experience in conducting and validating successful production trials, and through this process, she has honed skills in negotiation and commercialisation. Furthermore, her leadership capabilities extend to extensive experience in training new staff in the technical aspects of nanocellulose production and nanocomposite processing methods. Development and characterisation of biobased (textile fibres and) precursors for high-performance carbon fibre. Jorfi, Mehdi, Amiralian, Nasim, Biyani, Mahesh V. and Annamalai, Pratheep K. (2013). Biopolymeric nanocomposites reinforced with nanocrystalline cellulose. In Biomass-based biocomposites (pp. 277-304) Shrewsbury, Shropshire, United Kingdom: Smithers Rapra Technology. Amiralian, N. and Nouri, M. (2013). Circular and ribbon-like silk fibroin nanofibers. In Rafiqul Islam (Ed. ), Research in novel materials (pp. 191-206) New York, United States: Nova Science Publishers. Amiralian, N. and Nouri, M. (2009) Circular and Ribbon-Like Silk Fibroin Nanofibers by Electrospinning Process. Electrospun Nanofibers Research: Recent Developments, 279-295. Annamalai, Pratheep K., Amiralian, Nasim, Hosseinmardi, Alireza, Jiang, Edward and Marin, Darren (2018). Australian native Spinifex grass for improving the sustainability and performance of materials. In: Sixth International Conference on Natural Polymers 2018, Kottayam, (). 7-9 December 2018. Amiralian, Nasim, Hosseinmardi, Alireza , Martine, Benoit, Annamalai, Pratheep Kumar and Martin, Darren (2018). Elastomers reinforcement using cellulose nanofibre. In: The 11th Asian-Australasian Conference on Composite Materials (ACCM11), Cairns, QLD, Australia, (80-80). 29 July 2018 - 1 August 2018. Amiralian, Nasim, Annamalai, Pratheep K. and Martin, Darren (2017). Cellulose nanofibres from spinifex arid grasses. In: 2017 International Conference on Bionano Innovation, Brisbane, (). 24-27 September 2017. Amiralian, Nasim , Martin, Darren J. and Annamalai, Pratheep Kumar (2017). Fundamental understanding and applications of spinifex cellulose nanofibres. In: RACI National Centenary Congress, 17th Asian Chemical Congress and 19th General Assembly of FACS, Melbourne, Vic., Australia, (132-132). 23-28 July 2017. Septevani, Athanasia A., Mohd Amin, Khairatun Najwa, Evans, David A. C., Amiralian, Nasim, Pooley, Liam, Ho, Johnny, Shao, Liying, Martin, Darren J. and Annamalai, Pratheep Kumar (2017). Nanocellulose as a sustainable nanoadditive for polymer, building and construction materials. In: 2017 International Conference on BioNano Innovation, Brisbane, Australia, (). 24-27 September 2017. Mohd Amin, Khairatun Najwa, Amiralian, Nasim, Septevani, Athanasia Amanda, Martin, Darren J. and Annamalai, Pratheep Kumar (2017). Nanocellulose: A sustainable functional nanoadditive for improving the properties of thermoplastics and structural materials. In: RACI National Centenary Congress: 8th International Conference on Green and Sustainable Chemistry Conference (GSC8), Melbourne, Vic., Australia, (63-63). 23-26 July 2017. Mohd Amin, Khairatun Najwa, Amiralian, Nasim , Annamalai, Pratheep Kumar , Edwards, Grant A. B., Chaleat, Celine and Martin, Darren J. (2016). Cleaner and scalable processing of cellulose nanocrystal reinforced thermoplastic polyurethane nanocomposites. In: TAPPI International Conference on Nanotechnology for Renewable Materials 2016, Grenoble, France, (). 13-16 June 2016. Hosseinmardi, Alireza, Nasim Amiralian, Pratheep Kumar Annamalai, Wang, Lianzhou and Martin, Darren J. (2016). Mechanical reinforcement of natural rubber latex with cellulose nanofibres from Triodia pungens. In: International Elastomer Conference: ACS Rubber Division 190th Technical Meeting & Educational Symposium, Pittsburgh, PA, U.S.A., (). 10-13 October 2016. Amiralian, Nasim , Annamalai, Pratheep Kumar and Martin, Darren J. (2016). Spinifex nanocellulose applications in natural rubber latex and PA-11 thermoplastic composites. In: Cellulose Nanofibers Workshop 2016, Melbourne, (). 15 July 2016. Amiralian, Nasim , Annamalai, Pratheep Kumar and Martin, Darren J. (2016). Systematic production of high quality and low cost cellulose nanofibers and their potential applications. In: TAPPI International Conference on Nanotechnology for Renewable Materials 2016, Grenoble, France, (). 13-16 June 2016. Amiralian, Nasim , Annamalai, Pratheep Kumar and Martin, Darren J. (2015). High Performance Cellulose Nanofibrils From Spinifix, An Australian Arid Grass. In: Nanotechnology Entrepreneurship Workshop for Early Career Researchers 2015, Gold Coast QLD Australia, (). 10-11 June 2015. Amiralian, Nasim , Annamalai, Pratheep Kumar , Garvey, Chris and Martin, Darren J. (2015). Water and organic solvent behavior of thin and long cellulose nanofibrils easily deconstructed from Australian arid grass T. pungens. In: 9th Asia Oceania Forum for Synchrotron Radiation Research (AOFSRR 2015), in conjunction with User Meeting 2015, Melbourne, Australia, (). 25-27 November 2015. Annamalai, Pratheep Kumar, Amiralian, Nasim and Martin, Darren J. (2014). Alternative approaches and feedstocks for nanocellulose. In: 1st Australian workshop on cellulose nanofibers, Melbourne VIC, Australia, (). 17 July 2014. Amiralian, Nasim, Annamalai, Pratheep Kumar, Memmott, Paul and Martin, Darren J. (2014). Unusually high aspect ratio, easily deconstructed cellulose nanofibers from Australian spinifex (Triodia pungens). In: TAPPI Nano 2014: TAPPI 9th Annual International Conference on Nanotechnology for Renewable Materials, Vancover, BC, Canada, (). 23-26 June 2014. Nasim Amiralian, Pratheep Kumar Annamalai and Martin, Darren J. (2014). Worldwide Research and Report on 2014 TAPPI International Conference on Nanotechnology for Renewable Materials. In: 1st Australian workshop on cellulose nanofibers, Melbourne, (). 17 July 2014. Amiralian, Nasim, Edwards, Grant, Milne, John, Memmott, Paul, Annamalai, Pratheep K. and Martin, Darren (2013). Microfibrillated cellulose (MFC) from Triodia Pungens, an Australian native grass. In: Nano 2013: TAPPI 8th Annual International Conference on Nanotechnology for Renewable Materials, Stockholm, Sweden, (). 24-27 June, 2013. Martin, Darren James, Annamalai, Pratheep Kumar and Amiralian, Nasim (2015). Nanocellulose. WO2015074120-A1. Martin, Darren James and Amiralian, Nasim (2014). Nanocomposite Elastomers. 2014904956.